The most recent handset of the AXON series was launched by the ZTE in China last day. The smartphone was branded as AXON MAX. The AXON MAX was launched with huge display and with better processor. The handset also features better RAM. I think every feature is huge in AXON MAX, making it a real max. With a huge battery, this huge handset functions for the day long without any power shortage. Let us look on the specs of this latest smartphone which was first launched in China. AXON MAX has got a dimension of 160*80*7.5mm. The handset has a weight of 188 grams. The aircraft grade aluminium titanium alloy case provides for an extra protection for the inner parts. Even though the handset seems to be massive, it is not so massive while holding it. The 6-inched display is enough to please any user. Apart from this it is loaded with screen resolution of 1920*1080 pixels. The AMOLED display with 2.5D curved glass provides an exceptionally well experience for the users. The handset provides for Dual SIM which is of hybrid nature, which means one SIM slot is of normal nature, while the other one supports both SIM and microSD memory card. The processor of the smartphone comes from Qualcomm. The Snapdragon 617 with 64-bit Octa Core processor makes the handset function. The processor has got a processing speed of 1.5GHz. In addition to this the processor is supported by graphics by Adreno 405 GPU. The handset has got an extensive internal storage of 32GB which can be extended upto 128GB with the help of external microSD memory card. The RAM comes to be 3GB, which ensures that this gadget functions without any processing lag. The Android v5.1 Lollipop along with MiFavor 3.5 UI makes the handset function at the software end. The main snapper is powered by a lens of 16MP supported by dual-tone LED flash.It has got an aperture of f/1.9 and also has got a feature called Phase Detection Auto Focus, which helps the snapper to focus in just 0.1 seconds. The front cam comes with a lens of 13MP which provides for extensively quality selfies and video chatting.This handset is also loaded with fingerprint scanner which provides for unlocking the handset by tapping on the sensor on its back panel. The AXON MAX supports 4G LTE connectivity. Along with this it supports WiFi as well as Bluetooth connectivity along with GPS. This handset also supports USB Type-C port which provides for faster charging also. AXON MAX is loaded with a huge battery of capacity 4140mAh. The battery is also equipped with Quick Charge 2.0, which allows you to charge from 0 to 60% in just 30 minutes. This premium featured handset is tagged with a price of US$431 which comes to be 2799 Yuan. 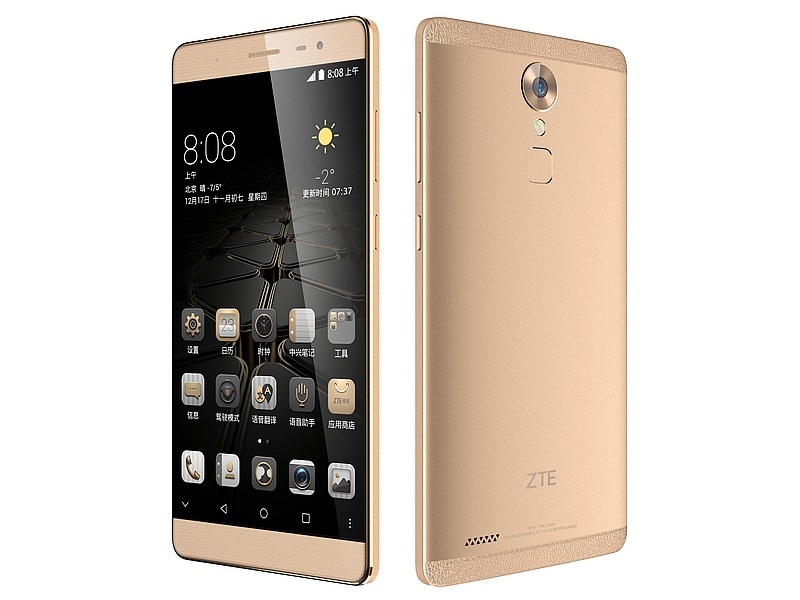 ZTE launches this latest gadget in Golden colour. Company declared that this handset will be initially launched in China by the next month, but nothing has declared about its global launch yet. Acer’s Predator 6: Blast of Power!